1. Preheat the oven to 200˚C and line a baking tray with foil. 2. Mix oil, cumin, cinnamon and Rooibos tea in a large bowl and season to taste. Add butternut and toss well. Place butternut with oil mixture on the baking tray. 3. Roast for 20 minutes or until the butternut is just cooked. Add cauliflower, seeds and chickpeas and mix to coat with the pan juices. 4. Roast for 10 minutes or until the cauliflower is cooked. 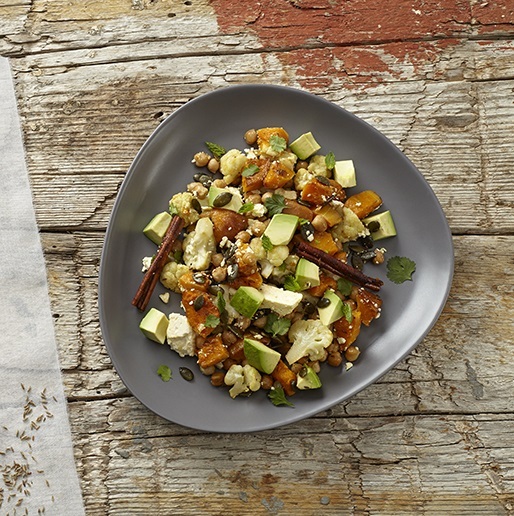 Spoon into a serving dish and add avocado, feta and herbs. Serve hot or at room temperature as a side dish or with baby salad leaves as a salad. Or spoon onto a wrap to enjoy as a light vegetarian meal.